A mezuzah (Hebrew: מְזוּזָה‎ "doorpost"; plural: מְזוּזוֹת mezuzot) is a piece of parchment (often contained in a decorative case) inscribed with specified Hebrew verses from the Torah (Deuteronomy 6:4-9 and 11:13-21). These verses comprise the Jewish prayer "Shema Yisrael", beginning with the phrase: "Hear, O Israel, the LORD our God, the LORD is One"
According to halakha, the mezuzah should be placed on the right side of the door or doorpost, in the upper third of the doorpost (i.e., approximately shoulder height), within approximately 3 inches (8 cm) of the doorway opening. Care should be taken to not tear or damage the parchment or the wording on it, as this will invalidate the mezuzah, which is considered Torah. Generally, halakha requires that mezuzot be affixed within 30 days of moving into a rented house or apartment. This applies to Jews living in the Diaspora (i.e., outside of the Land of Israel). For a purchased home or apartment in the Diaspora, or a residence in Israel (owned or rented), the mezuzah is affixed immediately upon moving in. The reason for this difference is that there is an assumption that when a Jew lives in Israel, Israel shall remain his/her permanent residence, whereas a home in the diaspora is temporary. Where the doorway is wide enough, Ashkenazi Jews tilt the mezuzah so that the top slants toward the room into which the door opens. This is done to accommodate the variant opinions of the medieval Rabbis Rashi and Rabbeinu Tam as to whether it should be placed horizontally or vertically, and also to imply that God and the Torah (which the mezuzah symbolizes) are entering the room. Most Sephardi, Mizrahi and other non-Ashkenazi Jews affix the mezuzah vertically, though Spanish and Portuguese Jews living in countries where the majority of Jews are Ashkenazim usually place it slanting. Some Jews touch their Mezuzah when entering and leaving the room. Barukh atah Adonai Eloheinu melekh ha‘olam, asher kideshanu bemitzvotav vetzivanu likboa‘ mezuzah. Blessed are You, Lord our God, King of the Universe, Who sanctified us with His mitzvot, and commanded us to affix a mezuzah. Any Jew can recite the blessing provided he or she is old enough to understand the significance of the mitzvah. After the blessing, the mezuzah is attached. Many observant Jews from all Jewish denominations have a qualified scribe check the mezuzot parchments for defects (such as small tears or faded lettering) at least twice every seven years. The commandment to affix a mezuzah is widely followed in the Jewish world, even by Jews who are not religiously observant. While the important part of the mezuzah is the klaf, or parchment, and not the case itself, designing and producing mezuzah cases has been elevated to an art form over the ages. 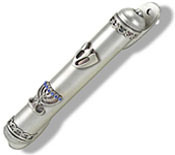 Mezuzah cases are produced from a wide variety of materials, from silver and precious metals, to wood, stone, ceramics, pewter, and even polymer clay. Some dealers of mezuzah cases will provide or offer for sale a copy of the text that has been photocopied onto paper; this is not a Kosher (valid) mezuzah, which must be handwritten onto a piece of parchment by a qualified scribe. the phrase "כוזו במוכסז כוזו"
Shaddai, one of the biblical names of God, also serves here as an acronym for Shomer Daltot Yisrael, "Guardian of Israel's doors". Many mezuzah cases are also marked with the Hebrew letter ש (Shin), for Shaddai. "כוזו במוכסז כוזו" is a Caesar cipher — a one letter shift — of the third, fourth, and fifth words of the Shema, "Adonai, Eloheinu, Adonai", "The Lord, our God, the Lord"; it is written on the back of the case, opposite the corresponding words on the front. This inscription dates from the 11th century and is found amongst the Hasidei Ashkenaz (medieval German Jewish mystics). According to the Sephardic custom (minhag), the phrase "כוזו במוכסז כוזו" is prohibited, and only the Hebrew word שדי (Shaddai) is to be written on the back of the mezuzah. This practice is supported by the Shulchan Aruch and the writings of the Rambam. The Ashkenazi custom of writing both phrases, however, was supported in the writings of the Remo. Legal battles in the U.S. The widely-popular Jewish practice of affixing a mezuzah to the entranceway of a residential unit has been rarely challenged in the United States or Canada, and until recently there was no case law precedent on the subject. "Hear, O Israel, the Lord is our God, the Lord is one. You shall love the Lord, your God, with all your heart, with all your soul, and with all your resources. And these things that I command you today shall be upon your heart. And you shall teach them to your children, and you shall speak of them when you sit in your house and when you go on the way, when you lie down and when you rise up. And you shall bind them as a sign upon your arm and they shall be an ornament between your eyes. And you shall write them upon the doorposts of your house and on your gates. And it shall happen, if you obey my commandments which I command you today, to love God within all your hearts and all your souls that I will give the rains of the land in its proper time, the light rains and the heavy rains, and you will gather your grain, your wine and your oil. I will give grass in your fields for your livestock. You will have enough to eat and you will be satisfied. Guard yourselves, lest your hearts lead you astray and you will serve other gods and you will bow to them. God will then become angry with you and will withhold the rain, and the land will not produce its bounty. You will quickly be lost from upon the good land that God has granted you. You shall place these words on your hearts and on your souls. You shall tie them as a sign on your arms and they shall be head ornaments between your eyes, and you shall teach them to your children to speak about them when you dwell in your house, when you travel on the road, when you lie down and when you arise. You shall inscribe them on the doorpost of your houses and your gates. So that you and your children may live many years on the land that God has promised to your forefathers, as many as the days that the heavens are above the earth." On the back of the scroll, the word Shaddai, the name of God, is written in Hebrew. The Zohar, the text of Jewish mysticism, explains that this is appropriate because Shaddai's three Hebrew letters - shin, dalet, yad - stand for the phrase shomer daltot Yisrael, "protector of the doors of Israel."